This example shows how to construct and work with the ppform of a spline in Curve Fitting Toolbox™. with l the number of polynomial pieces that make up the pp. In the figure below, breaks is [0,1,4,6], hence l is 3. While these polynomials may be of varying degrees, they are all recorded as polynomials of the same order k, i.e., the coefficient array coefs is of size [l,k], with coefs(j,:) containing the k coefficients in the local power form for the j-th polynomial piece. Here is an example of a pp made up of three quadratic polynomials, i.e., l = k = 3. The breaks are marked in red. polyval(a,x) = a(1)*x^(k-1) + a(2)*x^(k-2) + ... + a(k)*x^0. For the pp in the figure above, breaks(1) is 0, and coefs(1,:) is [-1/2 0 0], while breaks(3) is 4, and coefs(3,:) is [0 1 -1]. For t not in [breaks(1) .. breaks(l+1)), pp(t) is defined by extending the first or last polynomial piece. This returns, in fn, a complete description of this pp function in the so-called ppform. Various commands in Curve Fitting Toolbox can operate on this form. The remaining sections show some examples. To evaluate a pp, use the fnval command. To differentiate a pp, use the fnder command. 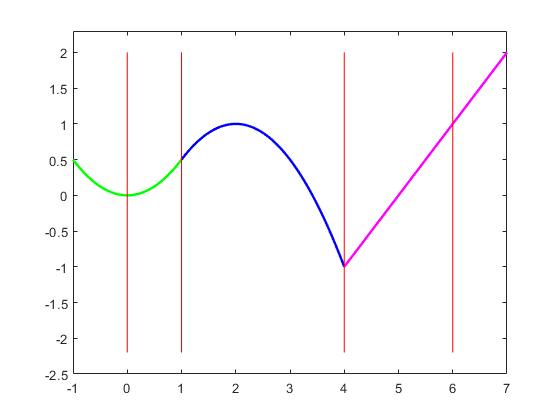 Note that the derivative of the example pp is continuous at 1 but discontinuous at 4. 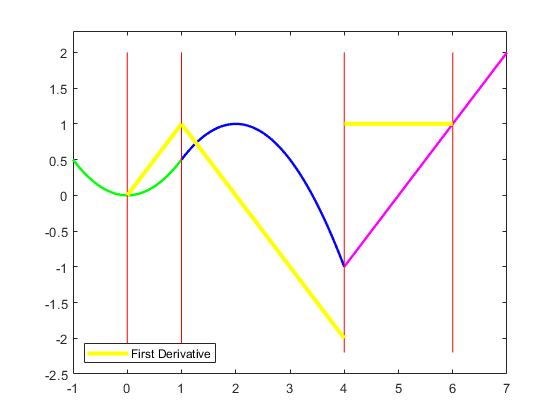 Also note that, by default, fnplt plots a ppform on its basic interval, i.e., on the interval [breaks(1) .. breaks(end)]. You can also use fnder to take the second derivative of a pp. The second derivative is piecewise constant. Note that differentiation via fnder is done separately for each polynomial piece. 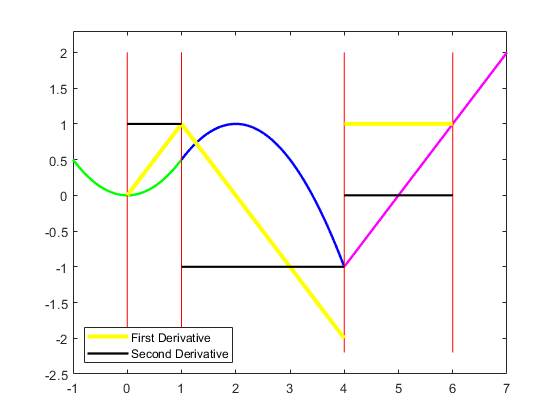 For example, although the first derivative has a jump discontinuity across 4, the second derivative is not infinite there. This has consequences when we integrate the second derivative. To integrate a pp, use the fnint command. 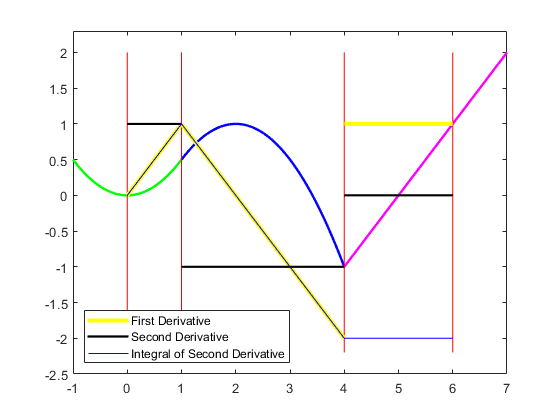 Note that integration of the second derivative does recover the first derivative, except for the jump across 4, which cannot be recovered, since the integral of any pp function is continuous. 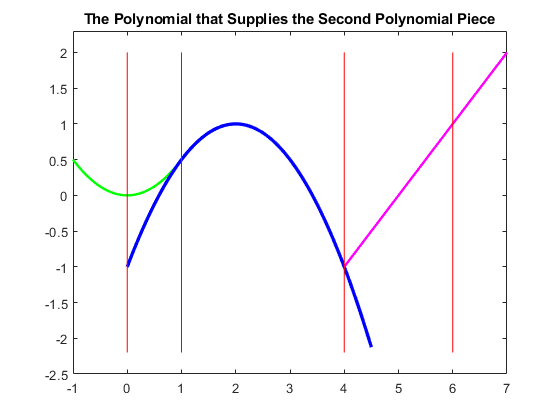 recovers the second polynomial piece, as this plot confirms. A pp can also be vector-valued, to describe a curve, in 2-space or 3-space. In that case, each local polynomial coefficient is a vector rather than a number, but nothing else about the ppform changes. There is one additional part of the ppform to record this, the dimension of its target. 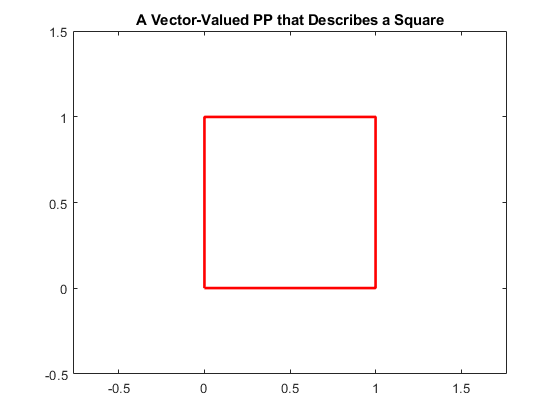 For example, here is a 2-vector-valued pp describing the unit square, as its plot shows. It is a 2D-curve, hence its dimension is 2. 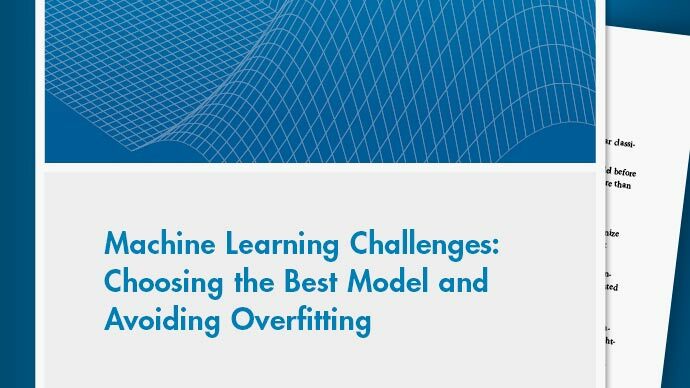 A pp in Curve Fitting Toolbox can also be multivariate, namely, a tensor product of univariate pp functions. The ppform of such a multivariate pp is only slightly more complicated, with breaks now a cell array containing the break sequence for each variable, and coefs now a multidimensional array. It is much harder to make up a non-random such function from scratch, so we won't try that here, particularly since the toolbox is meant to help with the construction of pp functions from some conditions about them. 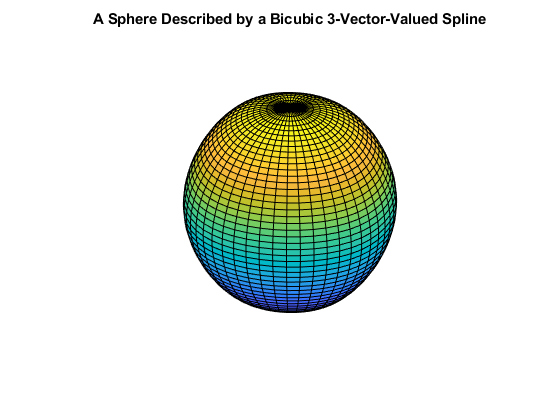 For example, the sphere in this figure is constructed with the aid of csape. While the ppform of a spline is efficient for evaluation, the construction of a spline from some data is usually handled more efficiently by first determining its B-form, i.e., its representation as a linear combination of B-splines. For more information, see Construct and Work with the B-form.